While Mr. CiclaValley has been incredibly busy the last two months, I’ve still let the cycling news flow like the Colorado River. Maybe not a great analogy under these drought conditions, but the idea is that I’ve still been streaming no matter what the conditions. Still, there is a lot of content I’ve wanted to write about I’ve kept on the back burner waiting for the proper time when things opened up. Unfortunately, that backlog is so deep that it seems more mountainous than my previous phase! 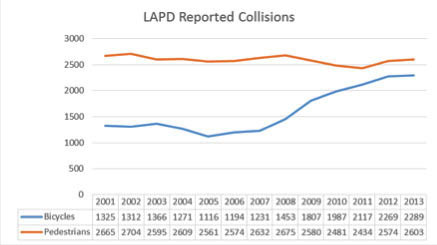 Back in March, Dennis Hindman sent me some data regarding recent data from the LAPD regarding collision statistics. It obviously caught my eye because as an advocate for all things cycling, I’m always looking for rays of sunshine. If you’re unfamiliar with Dennis, he has an encyclopedic knowledge of cycling statistics that’s so robust, you figure he could make a fortune counting cards. He’s guest posted on everyone’s favorite blog, Biking in LA, and you’ll find him defending the bicycling universe across the web. A Toluca Lake resident, you’ll find him at many of the valley’s LACBC’s functions, as well as any political event that affects the cycling needle. We’re virtually twins, except he’s good at numbers and I specialize in eighties music. When he sent me the numbers, I had a good first look at them. I knew they meant something, but I had to look at them a few times to understand their derivative value. Then again.And then again. Then I wrote an algorithm for how many more times I would read them before I would actually get to writing about them. Chart 1: Share of workers primarily using a bicycle to commute rose after 2007 in the results from the Census Bureau American Community Survey (ACS). Huzzah! It’s great to know that cycling is on the rise! What is interesting is to see that walking has stayed relatively the same after all of these years. I’m curious to know where the gain in cyclist’s commuting comes from? Is it mostly from expanded bike lanes and better transportation? Are these people former walkers and new pedestrian commutes are on the rise as well? It’s always fascinating how we get to these numbers. 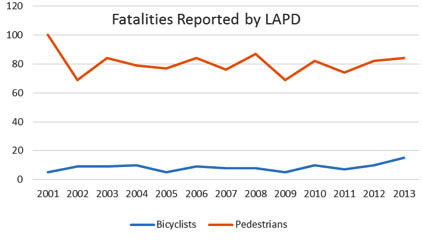 Chart 2: LAPD reported bicycle collisions have been rising annually since 2008. The large sudden jump in gasoline prices at the beginning of 2008 seemed to produce not only an increase in the share of workers who used a bicycle as their primary means of commuting to work, but also a sharp rise in bicycle collisions for 2008. The sharp drop in gasoline prices from about $4.60 a gallon in June of 2008 to $1.70 in January of 2009 did not reduce the share of workers who bicycled to work in 2009 on the ACS results–it went up. After more than doubling the miles of bike lanes in 2011 through 2013 there was not a sudden large jump in bicycle collisions as happened in 2008 and 2009. 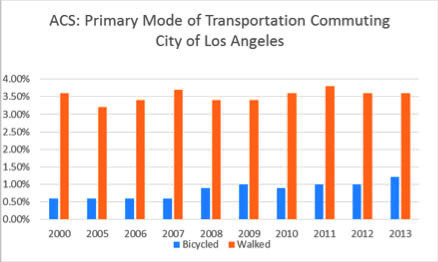 Perhaps this is indicative of a safety improvement for bicycling with more miles of bike lanes even though the percent of commuters using a bicycle on the 2013 ACS results increased by 20% from the previous year. Overall, this uptick is somewhat accepted given the increase in cycling, but what does this say about our preventative measures? I already mentioned added bike lanes, but cyclists have also gained ground with laws prohibiting harassment, cell phone and texting use. We also had a three foot rule recently enacted, but someone’s got to confirm whether a single ticket has been written so far. The laws are a step in the right direction, but unless they are enforced, this upward trend will continue. 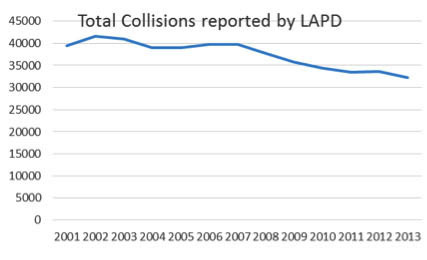 Chart 3: Total collisions reported by the LAPD have fallen significantly since 2008. This could be due to safety improvements installed for occupants of cars which lowered many collisions to non-injury. The LAPD does not typically do reports on non-injury collisions. Notice that the pedestrian reported collisions in the chart above did not go down significantly in the time period that the total collisions fell. If you match these statistics with national numbers, you’ll see this reflects a downward trend across the country. The straight line trajectory we can largely point to less cars on the road and fewer miles driven by the average American. One thing we know is that we won’t be eliminating cars anytime soon, so this trend will flatten at some point. The question is how will safe streets and Vision Zero policies affect these numbers in the future. Chart 4: Bicycling fatalities rose to its highest level on the chart at 15 in 2013 (10 was highest in previous years on the chart). The 2014 results will be about 10, judging by the totals that Ted Rodgers of BikinginLA got. Paging Malcolm Gladwell! With 2013 being the high point for fatalities is alarming to the eye, but it’s hard to make a lot out of this number. While 15 deaths is a 50% increase over the previous high, it’s still a small sample size. If there’s a glass half full, look at Chart 2 and see how bicycle collisions started to spike in 2007. You would have expected to see a similar upward trend with fatalities as well, so hopefully 2013 is an outlier. Still, this is something very important to keep an eye on. Obviously, I would prefer the collision and fatality numbers to sit at zero, but it is going to take work. Tireless work that is, like the efforts Dennis puts in and many others in the cycling community continue to push. It’s an exciting time for cycling in Los Angeles. The numbers show it. And the people do too!